Rebuilt Steinway at the Gasparilla Inn. Wow! I just played a wedding dinner reception last October 6, 2018. Master technician Larry Keckler recently reconditioned and rebuilt the vintage Steinway grande. He ordered the finest parts from Germany for this exciting project The Steinway dates back to 1924. It takes a number of tunings for the piano to hit its stride. The total time elapsed since his initial work has been about a year and a half. My gosh, now the piano is simply incredible! 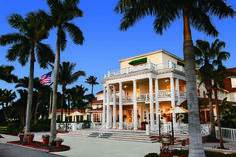 Gasparilla Inn on the isle of Boca Grande is the jewel of the South. I recently played for a wedding dinner reception. Now the piano has both a golden and velvety touch for the pianist and sound for the diners. The Inn offers a royal taste of the old South. I’m particularly inspired to play the ragtime music of Scott Joplin. His music is dated to the same era. Everything is happy! Greats of the past and present have graced the halls of the Gasparilla Inn. On December 20th I will begin my 10th year as the dining room pianist. This will be 6 nights weekly. The newly rebuilt Steinway has been magnificently reconditioned. It dates back to 1925. The Inn dates back to 1911. David believes music, should be all about beauty, enjoyment and relaxation. Thus he plays the music of Cole Porter, George Gershwin, Rodgers and Hart, Rodgers and Hammerstein, Michel Legrand, Billy Joel, Barry Manilow, Elton John, the Beatles, Scott and any composer(s) who write(s) memorable melodies. He even plays piano transcriptions from the King’s Speech (Beethoven’s 7th Symphony), Gustav Holst’s Jupiter, from the Planets. Also on the agenda is music by Chopin, Rachmaninoff, Beethoven, Debussy, Ravel and J.S. Bach. Kids are happy to hear his selections from the movies such as: Star Wars, Batman, Harry Potter, Home Alone, Close Encounters of a Third Kind, and Jurassic Park. Henry Mancini’s Pink Panther and the Baby Elephant Walk are as popular as fireworks on the 4th of July. They are loved by children and adults. See you there. My dates are Dec 20 through Easter. I play 6 nights weekly. Oh yes, I have room for one or two piano students in Sarasota.